"The government thought by killing Burhan they will control militancy. But his martyrdom has infused new life to the movement." Tral (Jammu and Kashmir): As Kashmir shuts on the first death anniversary of Burhan Wani, an uneasy calm hangs in the air in Tral in South Kashmir, the native town of the slain militant commander. Wary of Burhan’s popularity across the Valley, the security establishment has turned the town, nestled in the lap of a dense forest, into no-go area for outsiders, after separatists announced a week long protest from July 8. Wearing riots gears and armed with assault rifles, contingents of the Jammu and Kashmir police and paramilitary CRPF patrol the serpentine road from Awantipora on the national highway and to Tral. Each vehicle has to cross multiple checkpoints – the passengers are asked to come down and prove their identity. Anybody found to be an “outsider” is ordered to return. In spite of these massive security restrictions, young boys, for past several days, have been walking on foot, through orchards and agricultural fields, crossing rivulets, to evade security gaze and visit Shariefabad, a village at one end of Tral, where parents of slain militant commander live in a two-storey house. “It (people rushing) has picked up for past few days,” said a cousin of Burhan’s, as he offered refreshments to a group of boys, some of them with school bags slung over their shoulders. They had travelled all the way from Bandipora district in north Kashmir and Srinagar to “mark their presence” at Burhan’s home. Burhan was the poster-boy of new-age militancy in Kashmir and the most popular rebel commander the Valley has seen in almost three decades of militancy. “They (the government) thought by killing Burhan they will control militancy. But his martyrdom has infused new life to this movement which has now reached to every house in the valley. Now, nobody asks these young boys to pick up the gun, they instead volunteer themselves on this path,” Burhan’s father Muhammad Muzaffar Wani, a lecturer, told The Wire at his home. Then, Wani turned towards the young boys sitting in the garden of his house, eagerly waiting to listen to his every word. “Kashmir has changed in many ways,” he responds to a question by a journalist. “Does our younger generation have any future in this political uncertainty? No… Today our young boys are sacrificing their lives for better future of Kashmir,” Wani said. Barely half a kilometer away, on the link road near Eidgah, a group of youth in their late 20’s are busy talking about the “plan” for the week. “Burhan bhai revolutionised this movement, he is our hero,” said a young man who identified himself as Suhaib, adding that they were expecting people in large numbers to converge at Eidgah to offer prayers and hold a rally. But, he said it all depends on the government’s plans. Burhan’s grave, along with several other militants lie in one corner of Eidgah that was packed with mourners, who had travelled from across Kashmir on this day last year to participate in his. Today, both Eidgah and Burhan’s graveyard are out of bounds and have been sealed with concertina wires and a large contingent of police and central forces remained stationed outside, an indication about the government’s plan to not allow any gathering there. Both separatists and militants have announced the observing of Burhan’s death anniversary in a big way. A day before he was declared ‘Specially Designated Global Terrorist’ by US, the United Jihad Council (UJC) chief Syed Salahuddin, in a video message from Pakistan occupied Kashmir (PoK) issued a week long programme, ‘Hafta-e-Shuhuda’ (martyrs’ week), calling for shutdowns in the Valley on July 8 and July 13. “Hafta-e-Shuhada will be observed on both sides of the Line of Control,” Salahuddin said in the message. However when the issuance of the program by UJC chief was seen as a rebuff to the separatists who would otherwise issue the protest and other programs, Salahuddin clarified that the itinerary issued by him was only for the base camp in PoK, and that the Hurriyat was free to issue a parallel program for Kashmir. As per the new program which has largely remained unchanged the separatist trio of Syed Ali Shah Geelani, Mirwaiz Umar Farooq and Muhammad Yasin Malik, have called for holding a public rally on July 8 at Tral to pay homage to Burhan. Authorities have already chalked out the strictest restriction plan. Late on July 7, the district magistrate Pulwama issued an order prohibiting assembly of four or more men in the districts including Tral till further order. “We have clear direction to impose restrictions on assembly of people,” a senior police official said. In view of possible flare up, internet, social media and prepaid mobile services have been snapped for “indefinite” period across Kashmir while a reinforcement from CRPF, Indo-Tibetan Border Police (ITBP) and Sashastra Seema Bal (SSB) and Army have been fanned out across Kashmir to secure sensitive locations. “Keeping in view the strike call given by Hurriyat and UJC all necessary measures, including preventive arrests of miscreants, have been already taken. Moreover, all steps will be taken to ensure that there is no unlawful assembly and rallies,” said Kashmir’s police chief Muneer Ahmad Khan. In an unusual move, seen as a reaction to Burhan’s anniversary, the government has also announced a 10-day-long “summer break” in the Valley schools and colleges although the temperatures have not soared as yet. According to Jammu and Kashmir police, over 100 local boys have joined the militancy in Kashmir since Burhan’s killing. Around 54 of them are from south Kashmir that was the epicenter of 5-month long unrest in the region last year and remains out of bounds of pro-Indian politicians even today. “Today the youngsters are fearless. They defy parents to go out and participate in protest, rush to encounter site to breach cordons and throw stones at forces. This has never happened before,” political analyst Noor A. Baba told The Wire. When Burhan left home at the age of 15 to join Hizbul Mujahideen, the local militancy was on the verge of extinction. But when he rose to command the outfit in the Valley he had ushered this militancy into a new phase. The day he was killed Kashmir had over 100 local rebels, outnumbering, for the first time since 90’s, the foreign militants from Pakistan. Burhan used Facebook as a weapon to capture imagination of Valley’s younger generation which had grown in the era of political uncertainty while listening to the tales of injustice and human rights abuses people were subjected to since 90. His decision to take off the mask and reveal his identity on social media as a young gun-wielding commander acted as a catalyst for Kashmir militancy. Since his killing there has been no thaw in the anti-government protests and the Valley has seen steep rise in the violence. “There is no denying the fact that lack of weapons is stopping more youth from joining militancy. 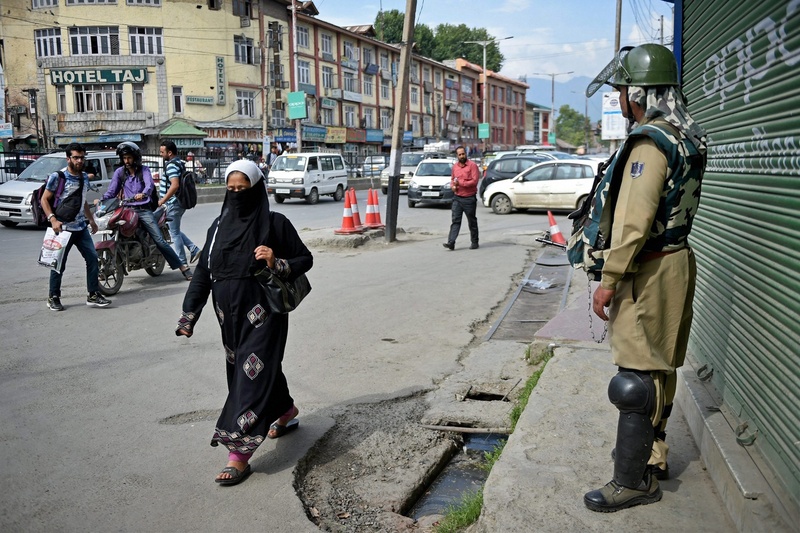 We haven’t seen this situation before,” a senior police official from south Kashmir told The Wire. Former chief minister Omar Abdullah had last year said that a dead Burhan can prove more dangerous than a living one and his grave may inspire more youth to take his path. Today, Burhan is a legend, hero-worshipped by young boys in Kashmir, who rush to encounter site to help militants escape, swarm at funeral of a militant, and talk openly of the “desire” to pick up gun. “When Burhan was alive he would make appeal youth to pick up guns. Today, his martyrdom has become a motivational force for our boys to join militancy…the need for the solution to this (Kashmir) issue has become more imperative now,” remarked Muzaffar Wani.